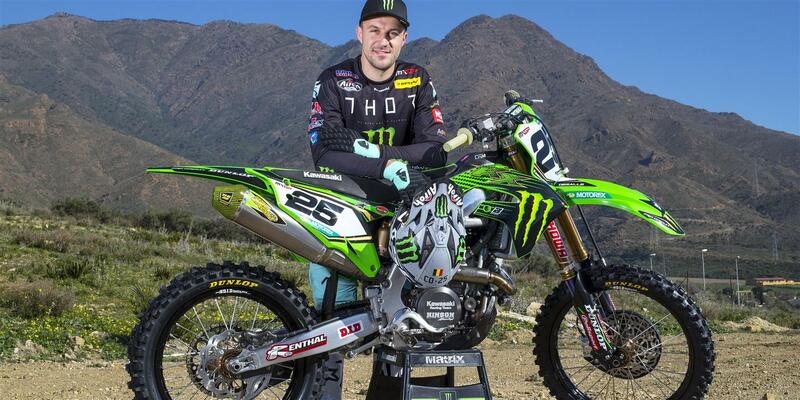 Clement Desalle enters 2019, his fourth season with the Monster Energy Kawasaki Racing Team, confident of continuing his success racing in the FIM MXGP World Motocross Championship. A native of the French-speaking southern half of Belgium, Clement raced over the frontier in France during his youth career. A stylish yet fearless racer even at the tender age of sixteen, Clement made a conscious decision to sidestep the more usual career ladder of graduating through the classes. On his promotion to adult racing he immediately jumped on a 450cc machine to learn the trade of GP racing the hard way in the premier class. He worked his way through the ranks to clinch his first GP victory and series medal in only his fourth season amongst the world elite and has ended the season amongst the world top three on four further occasions before injuries prevented him adding to that tally in recent years. Although he had never previously raced Kawasaki machinery prior to joining the KRT family in 2016, he immediately felt at home, having enjoyed a strong personal friendship for many years with team owner Thierry Chizat Suzzoni and team manager Francois Lemariey, the latter having been Clement’s race mechanic during his breakthrough season of 2009. The strength of these bonds was immediately confirmed with a display of the guts and resilience which have been the hallmark of his illustrious career to defy medical science as he entered the fray with a fractured arm sustained just a matter of weeks before the opening GP; Clement built his season to such good effect that he had returned to winning ways before the end of the summer and the momentum was carried through into 2017 with a season-long challenge for top honours, highlighted by consecutive GP victories in France and Russia, until a fractured vertebrae at the penultimate round saw him narrowly miss the medal positions. Returning to action before the end of the year Clement has enjoyed an intense winter of testing with the team's technical staff and partners to tailor the team’s factory bikes perfectly to his individual riding style. The birth two years ago of their first daughter Emma has cemented even further the strong family bonds with long-time girlfriend Andrea and also his highly-supportive parents and the 28 year old enters the new season brimming with confidence that he can achieve the ultimate racing success for both himself and Kawasaki.